Poker enthusiasts can now pay for the services of Poker Industry PRO, a one-stop shop for the latest poker news and data service, with bitcoins. Poker Industry PRO provides in-depth poker game analysis, data, and news. Poker Industry PRO is also celebrating the fact that they have integrated bitcoin into the PRO platform, as part of which they are offering a 20% discount on their annual news and data subscriptions. The offer, meant only for new subscribers, will be around till the end of July 2015. Paying for services and products with cryptocurrencies such as bitcoin is gaining popularity. Bitcoin is entirely revolutionizing the online gambling industry, and the number of operators integrating bitcoin into their gaming platforms is on the rise. Integrating bitcoin will surely boost Poker Industry PRO’s business as it has a huge base of customers, including journalists, poker room managers, investors, affiliates, regulators, analysts, and marketers. Poker Industry PRO claims on its website that they know the online poker industry better than anybody else. The website features daily news features, poker data, analysis, and weekly columns authored by industry experts who have more than 20 years of experience in the gambling industry. 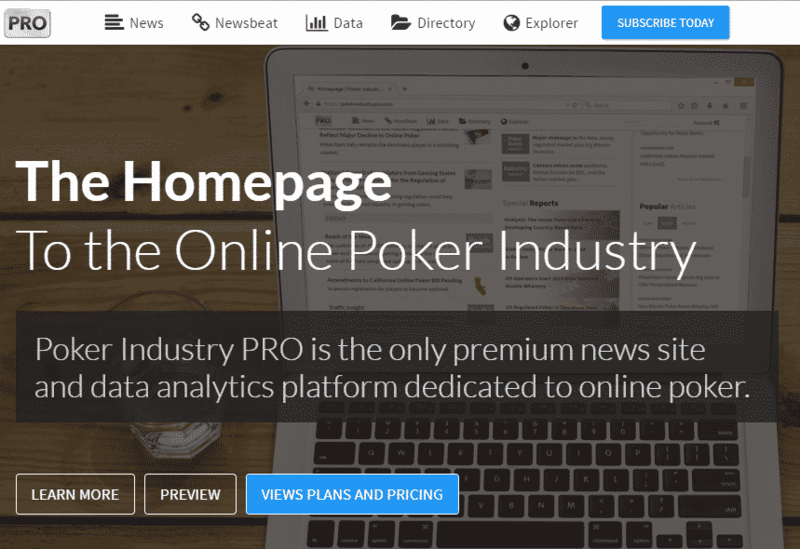 The website publishes more articles than any other online news service in the poker industry, covering a wide range of issues such as poker regulations, industry changes, promotions, software upgrades, and much more. Subscribers can also gain access to unlimited stats related to poker cash games and tournaments as compiling data is something that Poker Industry PRO has been doing for the past ten years. The news service includes hundreds of links to a wide range of opinions, news reports, interviews, media, discussion, and so on, which are updated every single day. Poker Industry PRO includes a web application that enables subscribers to access the site’s contents and features on tablets, desktops, smartphones, and also kindle. Subscribers can also opt to receive personalized newsletters everyday through email. The website enables its subscribers to understand the online poker industry thoroughly by giving them access to cash game and poker traffic data related to all the online poker networks and the web service updates this information every day. Subscribers can also gain access to an exhaustive database of online poker networks, poker sites, gambling jurisdictions, and operators. There are two subscription packages for players to choose from—PRO Data and PRO News. While the latter gives subscribers access to the news content and the webapp, the latter gives access to data, explorer, and directory features too. Those interested can purchase 3-month or 12-month subscriptions. While PRO Data costs $79 per month, PRO News costs $25 per month.